It can be annoying trying to start your car in the morning only to discover that your battery is dead. Closer observation will reveal that you left your headlights on or your alternator is malfunctioning. Jumper cables come in handy during these situations. All you need is find someone with a good car battery, plug one end of the jumper cables to your car battery and the other end to the borrowed battery. The car will roar back to life once you start it and your alternator will do the rest – charging your drained battery. Finding the right jumper cables can be a challenge. There are those that are too short or made from low-quality materials that cannot conduct electricity properly. 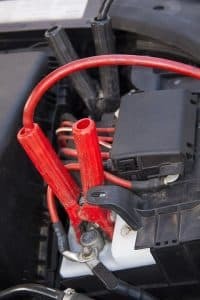 In this article, we are going to show you some key factors to consider before buying a set of jumper cables. Most of the jumper cables in the market measure 10 feet. This is ideal for salon cars but if you have a bigger car check out 20 to 25-foot jumper cables. This will enable you to connect the two batteries without straining. This is one of the most critical factors when looking out for jumper cables. If you have cables with the wrong gauge, less electricity will be conducted, and your car will not start. Most of the cables for SUVs and salon cars have a gauge of 4 to 6. For large trucks a gauge of 1 to 2 is adequate. Jumper cables should be made from conductive materials. The best are those made from copper than aluminum. Copper while being a good conductor is expensive, and that is why some people prefer cheaper aluminum cables. However, aluminum cables are not so good with heavy-duty trucks. A compromise exists where you have copper cables clad in aluminum. These grasp the battery terminals and critical for electricity transmission between batteries. They are designed to end to end. The most common type of clamps is alligator types. These have sharp pointed teeth that tightly hold to the battery terminals. Be on the lookout for jumper cables that have some form of insulation around the clamps. This prevents one from getting shocked accidentally. Heavy rubber is often used for insulation. Before starting the car ensure that you have the positives and negatives terminals well connected. The material used to create the jumper cables should be strong enough to withstand tangling. It can be annoying having an emergency only to struggle with untangling the jumper cables. They should also be easy to store. After purchasing the jumper cables have a special box to put them in; this avoids destruction by weather elements. Too much sunlight destroys the insulation on the cables, and this can lead to shock, moisture can reduce the conductivity of the terminals. We are always recommending to use a jump starter instead of jumper cables. Jump starter has protections inside of it like wrong-polarity protection, which make them much easier to use, and you can store them in your glove box! Check out our article: Best Jump Starters to buy. Why does a car’s battery go flat? If you have been experiencing dim lights and problems starting your car in the morning, then you need to look at the following reasons. Jumper cables are an emergency solution, but you need to get to the root of the problem if you do not want the problem to persist. The alternator is used to charge the car’ battery while powering certain electrical appliances like air-conditioning, power windows or radio. 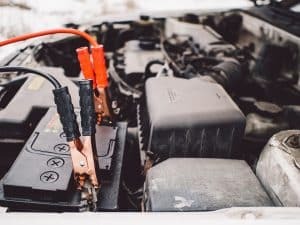 If the alternator is malfunctioning due to bad diode or stator problems, then your car’s battery will not charge fully. The charge is often so low that it cannot start the car hence the need for jumper cables. If you do not fix the alternator, the problem will persist. This will occur if you have an old car. There moments you are exhausted when getting home and you forget to switch off your headlights or leave one of the doors open. Your battery will be drained overnight, and you will need to use jumper cables to jumpstart your car. Once the car starts, the alternator will charge your battery, and that will be the end of the problem. Modern cars have warning signals should you leave your headlights on or a door unlocked. If you leave in an area experiencing extreme temperatures (either hot or cold), then it is common for lead sulfate crystals to build up around the battery. This makes it hard for the car’s battery to charge – especially for short drives fully. With time, the lead sulfate crystals will destroy the car’s battery. There moments your battery will fail to start because your battery terminals are loose. You will notice flashing dashboards lights. The solution to this is to get a ratchet or screwdriver and tighten the bolts. You do not need jumper cables for this because your battery is still fully charged. You can find occasionally poor some coca cola soda or another carbonate to clean your terminals from metal buildup. If you have been using the same battery for many years, it could be that its lifespan is over. The alternator could be working fine, but it is recharging a dead battery. You can check the battery for voltage power and if it is weak to purchase a new one. A good battery should last you more than four years, but this depends on usage and brand. Check manufacturer’s manual for battery lifespan. If you want to purchase a new battery, check out our review of the best car batteries. Jumper cables act as lifesavers anytime your battery is flat. All you need to do is connect one side of your cable terminals to your flat battery and the other end to a fully charged one. Once you start the car, the alternator will begin to recharge the flat battery. It is recommended that you drive for long distances so that the battery is fully charged before you turn off your ignition. There are various reasons for a flat battery including malfunctioning alternator, extreme temperatures, a human error like leaving headlights on and a battery that has lived its purpose. Ensure that you choose well-insulated jumper cables with the right ratings otherwise you may short circuit your electrical circuits. Select jumper cables that are long enough to ensure a smooth connection. If you have any other questions about Jumper cables, leave a comment down below!